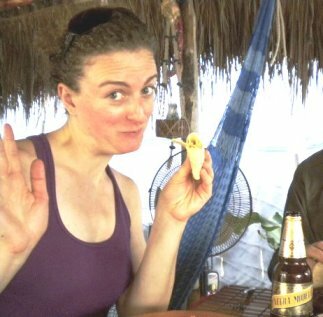 This is how happy you can be whilst eating a suckling pig taco in Mexico. I am a writer and food lover based out of Boston’s excellent Jamaica Plain neighborhood. I’ve been lucky enough to live in such glorious, far-flung spots as Aix-en-Provence and Paris, France; Fez, Morocco; rural Maine; Portland, Oregon; and San Francisco. I can’t trace my love for cooking back to a single thread, but I am sure that having to help my mom invent enough recipes to eat our way through an entire moose, combined with a healthy appetite, a few years in food service, and a passion for experiencing culture through taste have all contributed to it. I travel whenever I can, and happily return to my kitchen in Portland when the trip is through, ripe with new cooking ideas. From Proustian madeleines to transcendent ramen, our world is filled with food experience. My literature studies taught me the power of words, and my travels taught me the power of taste buds – here, they meet. My name is Audrey, et vous êtes les bienvenues.